A new twist on the old standard of sweet potato pie but no crust. This has just a hint of coconut flavor and is not overly sweet. You will love it! 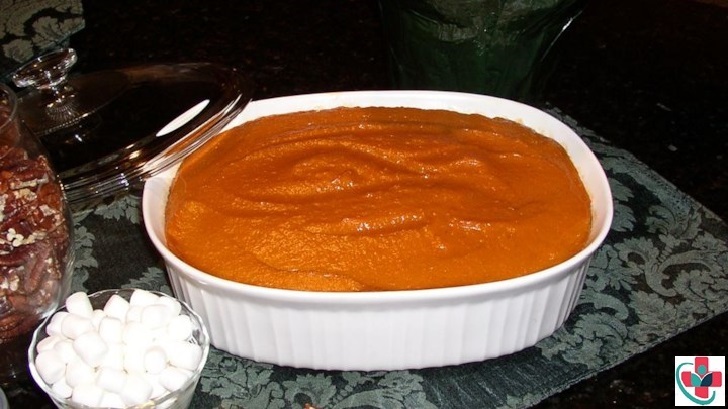 Great side dish for your Thanksgiving feast! Excellent dish! I made this for dessert and, after just one spoonful, my wife insisted "you gotta make this for my mother!" Even my kids ate his one! It could be less sweet, but the coconut flavor is fantastic! This recipe pairs the sweet starch with fresh ground coconut and cinnamon for a velvety texture and a nutty sweetness. Mix sugar, sweet potatoes, and coconut together with a spoon until smooth. Add butter, milk, and water and beat thoroughly. Beat the eggs slightly, then gradually beat them into the mixture. Add the spices and cinnamon. Continue beating until the mixture is creamy and very smooth. Pour the mixture into a greased dish and bake for 30 minutes in a hot oven, until golden brown. You can serve it hot or cold. Boil potatoes and blend with the mixture. Add ingredients to mashed potatoes; mix well. Pour into pie shell. Bake 30 minutes in 350-degree oven.